Gazprom has started laying the TurkStream gas pipeline in the deepwater area off the coast of Anapa. The operations were launched with the command given by Russian President, Vladimir Putin, during his visit to the Pioneering Spirit pipelaying vessel. "Pipelaying operations begin for TurkStream"
Vladimir Putin and Alexey Miller, Chairman of the Gazprom Management Committee, explored the machinery and equipment of the vessel, including its gas pipeline construction facility used for welding and applying protective coatings to pipes. 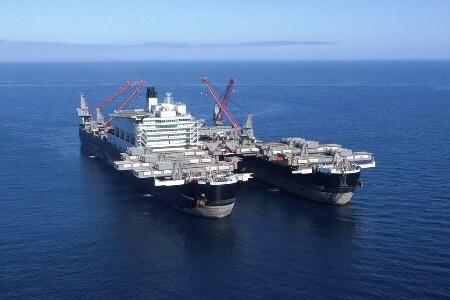 “Pioneering Spirit, the world's largest construction vessel, will have an important task to solve, namely to build the deepwater section of the TurkStream gas pipeline. This is a new direct and reliable route for Russian gas supplies to Turkey and further to southern and southeastern Europe. For Turkey natural gas is the key energy source accounting for 38% in the country’s electricity generation and used for heating and cooking in upward of 12 million households. TurkStream will substantially increase energy security in the region. Natural gas is of equal importance to southern and southeastern Europe. The declining indigenous gas production and the necessity to reduce coal's share in electricity generation across the Balkan countries create the potential for sustainable growth in natural gas demand in that part of Europe,” said Miller. South Stream Transport B.V. and Saipem announce the amicable settlement of mutual differences.